Since hitting a high of $1,889/oz. 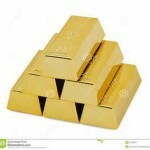 on 8/21/11, gold has steadily declined and is now about $1,100/oz. Investors sought gold out of misplaced fears that inflation would run wild due to lax monetary policy. Now that the economy is out of the doldrums and rates are about to rise, gold is weak. This is very good; gold does best as conditions deteriorate and does badly as things improve.